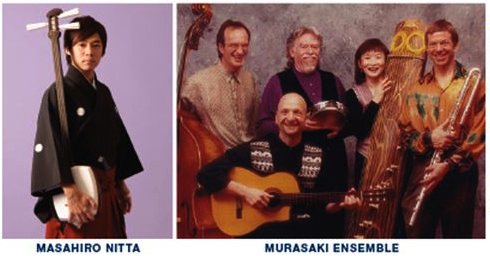 SAN FRANCISCO — Japanese Hogaku:New Sounds from America Japan, featuring Shirley Kazuyo Muramoto with the Murasaki Ensemble and a special guest, will be presented on Sunday, March 10, at 4 p.m. at Old First Concerts, 1751 Sacramento (at Van Ness), San Francisco. Some of the best musicians in their fields will be getting together to bring you music that you won’t find anywhere else. Young master Masahiro Nitta from Japan will dazzle with his lightning-fast Tsugaru shamisen. Joining him will be the musicians of the Murasaki Ensemble: Vince Delgado on Arabic percussion, Matt Eakle on silver “big wind” flute, Jeff Massanari on smooth groovin’ guitar, Alex Baum on his crazy string bass, and the group’s leader, koto master Shirley Muramoto, an inductee into the Japanese American Association of Northern California’s Bunka (Cultural) Hall of Fame. Also performing will be the amazing Kyle Abbott, director of Bachido.com, on Tsugaru shamisen; Michael Sasaki from the groups Cold Blood and Hiroshima on funk rock guitar; Karl Young on the meditative shakuhachi (bamboo flute); and Brian Mitsuhiro Wong, Muramoto’s son, playing his exquisite koto stylings. “The Japanese hogaku instruments shamisen, koto and shakuhachi, teamed with jazz, folk, rock and funk — only in the Bay Area could you experience this fab meeting of cultures and sounds,” said Muramoto. Muramoto is also premiering a new work for koto ensemble, which will feature some of her koto students and teacher friends Carol Kasumi Takao and Kashihiro Ohzato (Debbie Barker Brune). Nitta has been called “the greatest shamisen player in the world.” Born in Sapporo, Hokkaido, in 1984, he started to play Tsugaru shamisen at the age of 14 from the influence of his father, Hiroshi, and learned how to play in an unbelievably short time of only seven months. Soon after, he won a championship at the junior high and high school divisions in nationwide contests, then dominated national Tsugaru shamisen tournaments in 2000, 2001 and 2002. Admission is $17 general, $14 for seniors (65 and over) and full-time students, free for children 12 and under. To purchase tickets, go to www.oldfirstconcerts.org/performances/. For more information, call (510) 482-1640, email [email protected] or visit www.murasakipro.com. Parking is available at the Old First Parking Garage, located at 1725 Sacramento St. (between Van Ness and Polk). You will receive a discounted rate of $5 for four hours with validation, which is available at the nox office. For street parking note that San Francisco parking meters are now active on Sundays from 12 to 6 p.m.